Raised 1933-37 by A.C. Nash, Scutes Farm, Hastings, East Sussex from the pip of a New Zealand Cox’s Orange Pippin. 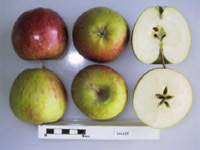 The Dalice apple has a rich, delicate, aromatic flavour which is reminiscent of but not as intense as Cox. The flavour can be less interesting and the colour poor.